As summer approaches and temperatures rise, I often find myself lacking the motivation to be cooped up in a gym — especially when the sun is shining! So one beautiful summer day, I decided to try and get in a solid workout while also enjoying a day at the beach. (Two birds, one stone, right?) After jogging down to the shore as my warm-up, I completed this bodyweight workout on the sand. Not only was it challenging and left me feeling completely satisfied, but I got to enjoy the sun and sand while I was at it! The best thing about working out on a beach is that the sand acts as added resistance, making routine exercises that much more challenging. Believe me: You will feel it the next day (or few days) with this workout. 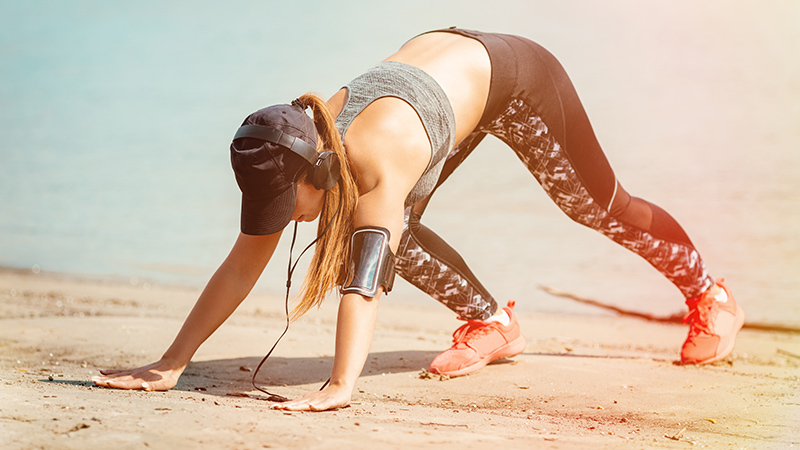 This particular workout is designed to be done on the beach or sand, but can easily be done anywhere you have a little bit of space, like a backyard, a park or studio. Begin by drawing two lines in the sand approximately 15 to 20 feet apart. The farther apart, the harder the workout. Start behind one of the lines and perform the walking lunges until you reach the second line. Immediately start performing the second exercise – 10 reps (each arm) of commander plank. Stand up and take one large step towards the starting line, followed by a star jump, step, star jump until you reach the starting line again. Once you reach the line, drop down and perform 10 push-ups. 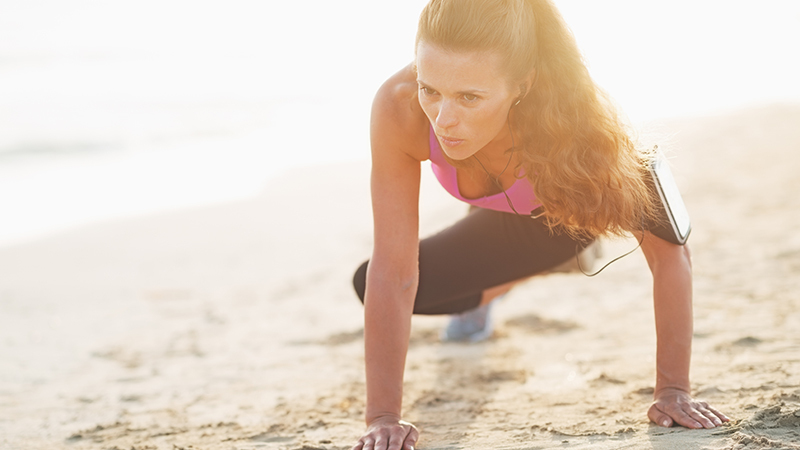 Place your hands down on the sand with your knees slightly bent – Bear crawl back to the starting line. Once you reach the line, do 10 cross mountain climbers (each leg). Begin standing with your feet shoulder width apart and your hands on your hips. Step forward with one leg, flexing the knees to drop your hips. Descend until your rear knee nearly touches the ground. Your posture should remain upright, and your front knee should stay above the front foot. Begin in a full plank. Lower your right elbow to the ground and then your left, so that your body is now in elbow plank position (as displayed in the picture). Put your right hand on the ground, straightening your right elbow followed by your left arm. You have now returned into full plank position. Begin in a relaxed stance with your feet shoulder width apart and hold your arms close to the body. Take one step forward one foot at a time. Then, squat down halfway and explode back up as high as you can extending your arms and legs into the air. As you land, bring your limbs back in and absorb your impact through the legs. Take another step forward and perform the jump again and again until you reach your destination. Start in full plank position, with your arms straight and your core engaged so you feel as though you have a straight line going from your neck to your ankles. Steadily bend your elbows and lower your body as close to the ground without touching. Keep your elbows relatively close to your body. Pause slightly when your body is lowered and then use your strength to move your body back up into the starting plank position. Pop-up from the push-up position, and run as fast as you can to the other line. This is an explosive motion, so put all of your effort into speed. You will find the sand will weigh you down but that encourages you to put more effort into the speed of your sprint. 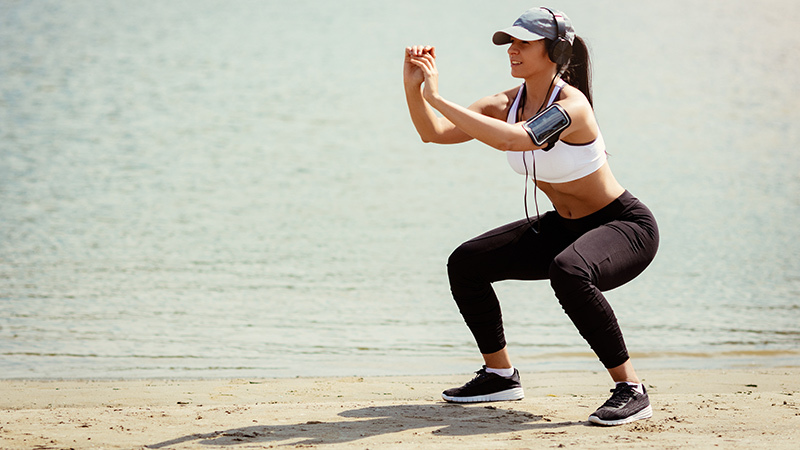 Start by doing a regular squat keeping your knees in line with your toes. Then engage your core and jump up explosively as high as you can straight up. When you land, lower your body back into the squat position to complete one rep. When you perform this movement, try to land as soft as you can. Crouch down with hands in front of your shoulder-width apart and your feet behind you. 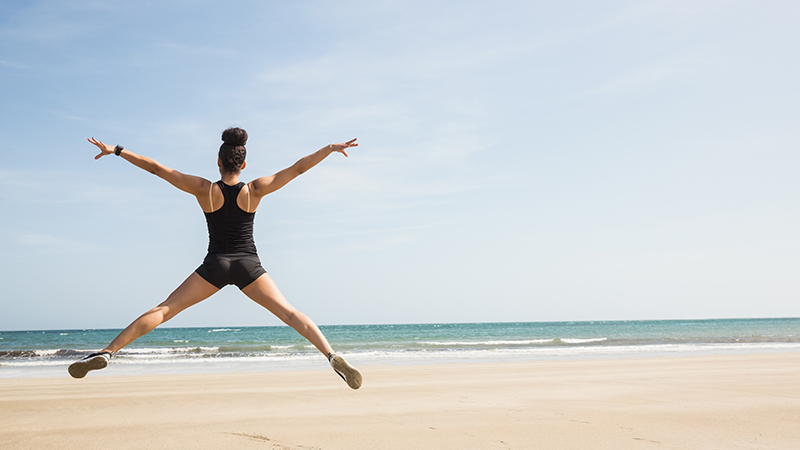 Your hips are extended in the air and your focus is looking forward. Crawl forward starting your right hand, followed by your left foors and vice versa. The challenging part is keeping your body low to the ground. Start in a plank position with arms supporting your body, keeping your back straight like a table top. Draw in your abdominals in and drive one knee across your body towards your opposite elbow. Switch legs quickly and perform the exercise with the other leg. Continue “running” your knees across your body so each knee goes towards the opposite side of the body. Prevent bouncing up or arching your back by engaging your abs. 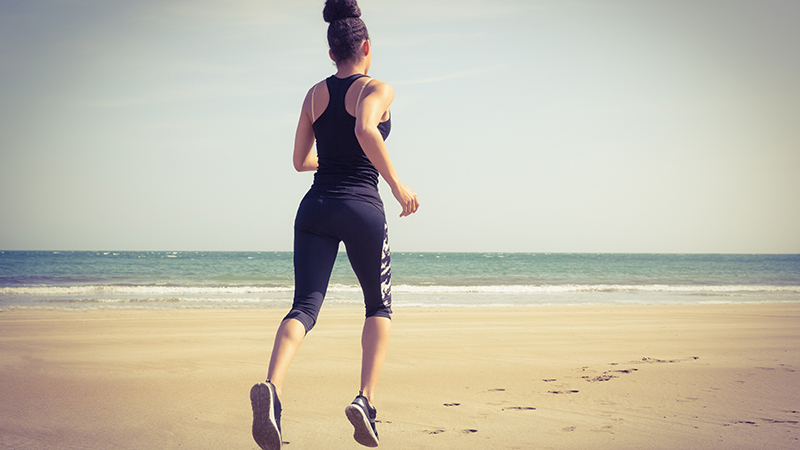 I like to do a little warm-up before so I normally jog 10 mins to the beach and then jog home as a cool-down and stretch.